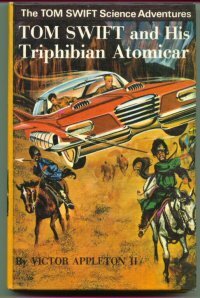 One little-known fact about the Tom Swift series is that many Tom Swift books were printed in Great Britain by a firm called Collins. As the books are physically different from the editions published in the United States, I decided to write up a page on the British editions. Some time after I had written and posted the page, I received an e-mail from Robert Holte, who has his own Tom Swift page at http://www.csi.uottawa.ca/~holte/tomSwift.html. Robert Holte gave me a lot of new information on the British Tom Swift books, and for that I am grateful. Thanks, Robert! 1) At first I thought the text in the British edition matched the G&D editions exactly. 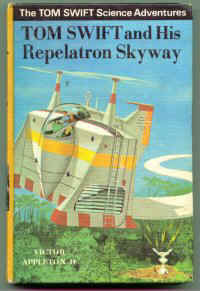 Robert Holte, however, e-mailed me and told me that there are actually a sizeable number of differences in wording and spelling in the British books -- he had he found 80 differences in the first 50 pages of Tom Swift and his Giant Robot). Steps came dashing down the stairway. Immediately they heard the sound of hurrying steps on the stairway. Evidently the British books had been very carefully read and edited, although the story itself is exactly the same. The rephrasing does make more sense than the original, but I wonder why they went through so much trouble? I'll probably never know. 2) The font size in the British edition is much smaller than the font used in the American edition, and thus the story in the Collins Sonic Boom Trap takes up 18 fewer pages than that G&D Sonic Boom Trap. Part of this might be accounted to the fact that some of the G&D pictures are not in the Collins edition: in the Sonic Boom Trap, for example, an excellent picture of a horrified Chow had been removed. 3) The chapter headings in the two editions are quite different. In the G&D, Roman numerals and a standard font is used. In Collins, normal Arabic numerals are used, and the name of the chapter is in a bold, italicized font. 4) The Collins edition is about a quarter inch shorter than the G&D edition, and the cover has a markedly different texture. 5) The paper in the Collins edition seems to be a much lower quality paper than that used in the G&D edition. 6) On the spine of the G&D edition, there is a little white diamond that lists the number of the book. In my copy of the Sonic Boom Trap, that diamond is not present. Robert tells me that this number can be found on some British books -- but they are "not the same ones, not even in the same order, and not in a diamond." 7) Also on the spine of the G&D edition is a little ID number; for the Sonic Boom Trap the number is 9126. That number is not present on the Collins edition. 8) On the bottom of the spine of the G&D editions are the words "GROSSET & DUNLAP." The Collins editions have replaced that with "COLLINS." 9) The top of the pages on the G&D editions is a nice blue color. On the Collins editions, the pages are black. 10) On the back of the G&D Sonic Boom Trap, the book reads "These are the famous books about a young scientist whose amazing inventions promise to be the great achievements of the future." 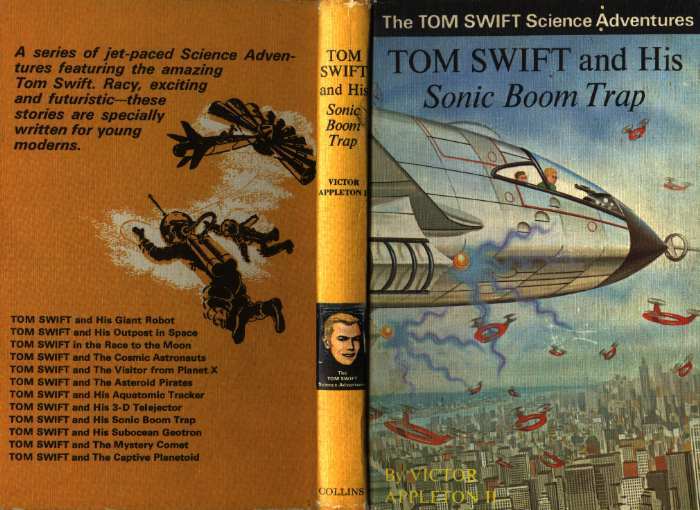 The wording on the Collins edition reads quite differently: "A series of jet-paced Science Adventures featuring the amazing Tom Swift. Racy, exciting and futuristic--these stories are specially written for young moderns." 11) On the very bottom of the back of the G&D Sonic Boom Trap is the line "GROSSET & DUNLAP, Inc. Publisher. New York I O, N.Y." This line is not on the back of the Collins edition. 12) And finally, the most glaring difference of all: at the top of the front cover of the Collins editions is an ugly, inch-wide black stripe. 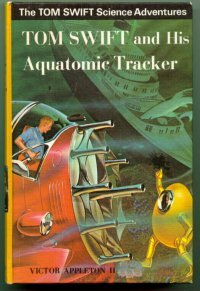 On the black stripe, in white letters, are the words "The TOM SWIFT Science Adventures"
From what I have seen, the British Editions are not particularly hard to obtain, and usually sell for less than their G&D counterparts. 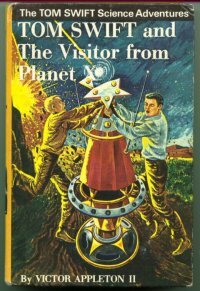 If you are looking for the last few Tom Swift titles, it might be a good idea to look for Collins editions: the last few Collins titles usually sell for half to a third of their G&D counterparts.